Samsung teases new tablet and notebook displays with resolutions of up to 3200 x 1800. When Google released their Chromebook Pixel earlier this year, its pixel density topped anything on the market, including Apple's Retina MacBook. That could be set to change however, as Samsung is working on a display that could best both those devices. According to a press release by the company, a pair of displays are planned for the Society for Information showcase at Vancouver this week. The displays include a 10.1" WQXGA panel with a resolution of 2560 x 1600 for tablets and a 13.3" WQXGA+ display with a 3200 x 1800 resolution for notebooks. By utilizing a decreased number of driver circuits and increased LED BLU efficiency, the duo will also deliver up to 30% energy savings compared to the current generation of displays. These newest displays come on the heels of a recent announcement by Sharp, where they unveiled that they will begin producing IGZO panels with UltraHD resolutions for notebooks. It is not yet known if the panels will simply be displayed or will be included as part of actual products, but we should know more in the coming days. VANCOUVER, British Columbia--(BUSINESS WIRE)--Samsung Display announced today that it is showcasing several industry-leading technologies and mobile to extra-large-sized display prototypes at the Society for Information Display’s Display Week 2013, May 21-23, 2013, in the Vancouver Convention Centre (Booth 700). These include a Full HD (1920×1080) mobile AMOLED display with the world's broadest color gamut, and an 85-inch Ultra HD (3840×2160) LCD TV panel with extremely vivid color and low power consumption. In addition, Samsung Display shows a unique new Diamond Pixel™ technology being highlighted at the show, and a featured LCD technology that enables local-dimming control in direct LED-based LCD panels. The world's first mass-produced 4.99-inch Full HD mobile AMOLED display offers the world’s broadest color gamut with a 94 percent average rate of reproduction for the Adobe RGB color space. The Adobe RGB standard is about 30 percent broader than general sRGB standards. Samsung Display fulfills the most advanced mobile AMOLED display demands with its Diamond Pixel™ technology. This technology, based on the idea that the human retina reacts more to green than other colors, places more green than red and blue pixels in the pixel structure of AMOLED display panels. With the new technology, Samsung's Full HD AMOLED display can provide text messages 2.2 times clearer than HD (1280×720) displays. So, when curvilinear letters on the panel are magnified two or three times, Samsung’s Diamond Pixel™ technology enables text to be reproduced more smoothly (fewer “jaggies”) and accurately than those produced with conventional LCD technology. Samsung Display is also providing Display Week participants with firsthand experience comparing the color gamut, color accuracy and letter quality of Full HD AMOLED displays in a special “experience zone” within its booth. The booth will provide a clear comparison between AMOLED and LCD displays. Attendees can see not only true crisp colors in the intricate wing pattern of morpho butterfly images, but can also view an image of a strand of knitting wool so detailed that it can only be appreciated using a Full HD AMOLED display. Furthermore, Samsung Display's exhibit of an 85-inch ultra HD TV panel showcases a LCD technology that enables local-dimming control in a direct LED-based LCD panel. The panel can save 30 percent of typical LED BLU power consumption. Its local-dimming control enables vivid color rendering including incredible black images, 80 percent brightness uniformity, and a remarkably-enhanced contrast ratio. For the latest in green technology, Samsung Display is highlighting advanced power-saving solutions for smart mobile devices including smartphones and tablets. Here, Samsung Display has innovatively reduced power consumption of AMOLED display by enhancing the luminous efficacy of AMOLED pixels. Samsung Full HD AMOLED displays provide a 25 percent power-savings over that of existing HD AMOLED displays. Samsung Display is also exhibiting a 10.1-inch WQXGA (2560 x 1600) LCD for tablets and a 13.3-inch WQXGA+ (3200 x 1800) LCD for notebooks, which each can deliver 30 percent greater power-savings than that of existing LCD tablet displays, by decreasing the number of driver circuits and increasing the efficiency of the LED BLU. Also, Samsung is spotlighting a 23-inch multi-touch LCD display that can detect 10 touch points simultaneously. The prototype enables playing of the piano with exceptional finesse, or drawing a highly detailed picture on a monitor or a tablet. About Samsung Display Co., Ltd.
Samsung Display Co., Ltd. is a global leader in display panel technology and products. 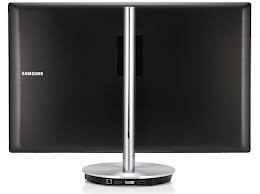 Employing approximately 39,000 people at seven production facilities and nine sales offices worldwide, Samsung Display specializes in high-quality displays for consumer, mobile, IT and industrial usage, including those featuring OLED (organic light emitting diode) and LCD technologies. As a total solution provider, Samsung Display strives to advance the future with next-generation technologies featuring ultra-thin, energy-efficient, flexible, and transparent displays. For more information, please visitwww.samsungdisplay.com.